Today morning the fierce gun battle that was going on at the Taj Heritage Hotel Building trying to bring down the last of the terrorist, finally culminated with a huge fire breaking out at the first floor and the body of the terrorist was thrown out of the first floor window. 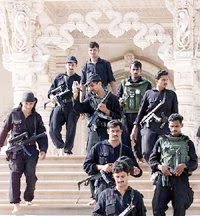 There was high drama the whole night as the terrorists who were battling with the NSG Commandos inside the first floor of the Taj building kept running from one side of the building to another, but finally our men got the better of them and were able to corner them and in the process, all the terrorists were killed. All in all so far, according to the Director General of NSG, three terrorists have been killed inside the Taj Hotel and hopefully that is the end of this operation, although the combing process is still going on to rescue any staff or residents who may still be locked up in their rooms and to make sure that there are no more of the terrorists hiding anywhere. The mood of the NSG Commandos was jubilant as they came out of the Taj entrance, all smiling and happy to have successfully completed their task in annihilating the Terrorists who had held the whole of Mumbai to ransom for more than 56 hrs. The mood and attitude of these Commandos who risked their lives and put themselves in the line of fire without fear was evident when a reporter tried to interview one of them. She asked them,"How difficult was it for you, inside there?" And this is the pat reply that comes from the man all smiles, "Hamare Liye Kuch Bhi Mushkil Nahin Hain!" Translated in English, "Nothing is difficult for us." Hearing this simple statement from the NSG Commando just minutes after he has risked his life and saved the whole of Mumbai, allowing them to sleep in peace, filled my heart with pride. It was these Commandos who successfully completed the task of eliminating all the terrorists from the Oberoi, Trident Hotel, The Nariman House and now finally the most difficult, The Taj Hotel. I am very glad that for the first time in India, all of the citizens have been able to watch our men in uniform in action LIVE on TV and maybe this will make them realize the importance of these men in uniform and the risks they take to make us all feel safe. I hope that the citizens of India will now give more respect to the men in the defense forces. Just a few days back the politicians were reluctant to increase the pay and allowances that were long time overdue to these men. They not only did not increase the pay and allowances as demanded by the defense chiefs, to add further insult to injury, they also downgraded all the ranks of the men as compared to their bureaucratic civilian counterparts who are now enjoying a senior position and double pay in the comforts of their plush offices and comfortable homes! Inspite of all this, I am proud of these men of uniform who are still fighting for their country, the true patriots and our heroes and I hope that these words of the Commando "Hamare Liye Kuch Bhi Mushkil Nahin Hain!" will ring in everyone's ears for a long time to come.